Paperback, with flaps, 240 pages, 11.8 x 18.7 cm, 4.6 x 7.4 in. An irresistible temptation to read that goes far beyond all the dreary recommendations in literary canons. 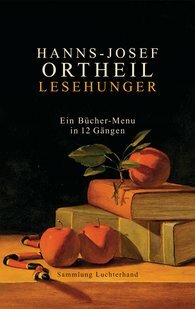 In "Hunger for Reading" ["Lesehunger"], Hanns-Josef Ortheil tells us about his hedonistic love of reading, about the rituals and secrets of reading, about the times of day and places most suitable for reading, and the pleasurable immersion in books and the gradual emergence out of books. Over and above this, "Hunger for reading" ["Lesehunger"] is an opulently served reading meal enriched by Hanns-Josef Ortheil with many recommendations of book and reading matter that do all they can to lure readers to get down to some unrestrained and anarchical reading far off the beaten track of narrow-minded literary canons.